Home→Audiophile Equipment Reviews→JBL XPL-200A: The Holy Grail of Audio? The JBL XPL-200A is considered by many to be the holy grail of loudspeaker systems. They are coveted by collectors and music lovers alike, especially when they are paired with one of the most rare of all audiophile components: the JBL DX-1 active crossover network with an XPL-200A card set. When we were offered the opportunity to bring a pair into the listening room, we felt honored. The XPL-200A is the result of the engineering genius of Greg Timbers, the Antonio Stradivari of four-way loudspeaker system design. While the XPL-200A is the official top-of-the-line speaker in the XPL series, we are aware that at least one XPL-250 (based around the JBL 250ti was built. So, in retrospect, perhaps the XPL-200A is merely an illusion of the true grail designed to deceive those found unworthy of the XPL-250. The XPL-200A comes in mirror image pairs. It’s comprised of the JBL 2214H-1 12″ bass , the 115H-1 6.5″ mid bass , 093TI 3″ mid frequency, and the 046TI 1″ high frequency transducers. These crossover at 300 Hz, 1.1 kHz, and 4.5 kHz respectively. JBL’s claimed frequency response is 35 Hz – 25 kHz (+/-6 dB). Flipping the passive crossover network switch to the bi-amp position causes the two upper and lower drivers to crossover at 250 Hz. Sensitivity is 90 dB (2.83 V @ 1 meter). The XPL-200A can handle 200 watts RMS continuous power. It’s maximum recommended amplifier is a whopping 800 watts RMS! The system nominal impedance is 6 ohms. They weigh-in at 90 lbs. each. There were two versions of the system: XPL-200 and XPL-200A. The only difference being tweaks to the crossover in the XPL-200A. From what we could gather, the XPL-200 was available in hand rubbed walnut and black lacquer. The XPL-200A was available in black and white lacquer in the USA, but walnut continued to be available in Germany. The cabinet design and build was, and remains, among the best in the world. Tapping on its surface is similar to doing so on a granite counter top. The piano black lacquer finish on the pair we received is flawless. The front baffle is covered by a silicon rubber frame covered with a brushed silicon-based fabric to eliminate undesirable reflections. All corners of the cabinet are rounded. The front baffle is staggered with high and mid frequency transducers being back-set to correct for time alignment. The grill tapers in the front making the XPL-200A appear to have a narrower vertical profile. The pair we received included both a JBL DX-1 crossover, and a pair of original XPL-200 stands that tilted the speaker back about 4 degrees. The tilt angle further corrects the time alignment of the system. The stands included carpet spikes and wire guides. The rear of the cabinet has a port, two pairs of gold plated binding posts, and two switches. The first switch is for selecting between standard setup and bi-amping. The other allows the high and mid frequency transducers to be attenuated by -2 dB. The most unique feature of the XPL-200A is the 3″ 095TI mid frequency transducer. It’s impact on the sound of the speaker system will be covered later in this review. We decided to begin our listening tests with a single Bryston 4B-ST and the high/mid attenuation set to flat. The speakers were placed (on their stands) 9.5′ apart and 31″ from the rear wall, with 36+” from either side wall. After some initial testing we discovered the best toe-in was 2.5″ (measured from the wall to the outside corner). Using our reference recording list, we spent a day listening and taking notes. The XPL-200A exhibited excellent dynamics, transients, and tonality. They’re very enjoyable speaker, but they had a tendency to “blur” mid-range imaging. 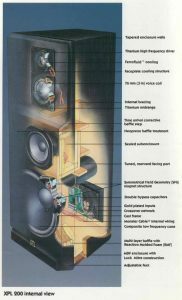 It was a rather strange anomaly in an otherwise excellent loudspeaker system. In some ways they sounded almost like a full-range electrostatic speaker, and in others they appeared to have ribbon-like characteristics. They were very good but not the ‘holy grail’ we had expected. On day two another Bryston 4B-ST was brought into service, along with the JBL DX-1 active crossover. The speakers were left positioned as before, and we began listening to the same series of tracks as the day before. It took a few hours to fine tune the DX-1 and balance out the system. Room Equalization Wizard (REW) confirmed our settings on the DX-1. The DX-1 dramatically changed the XPL-200A system. The blurring of the mid-range we had experienced the day before was replaced with an open “airy-ness” similar to the best horn systems but far more controlled. Transient response was also approaching that which we would expect from horn-based systems. The sound stage was open and deep. Imaging was razor sharp, making the stereophonic illusion truly life-like. At this point we brought our two JBL studio subs online, and with the aid of REW, set the crossover at 42 Hz. With the lowest frequencies reinforced, the XPL-200A system proved beyond doubt that it was worthy of the title “holy grail”. 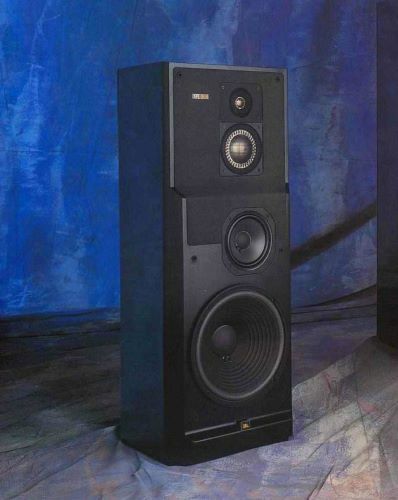 Here was a pair of speakers built in the early 1990s that retailed for $3,600 (with DX-1) whose only peers wouldn’t be available for another 20 years, and at a cost of $20,000+. The Paradigms and B&Ws we had been preparing to review paled in comparison. Even our reference monitors, the JBL LSR6332, found themselves outclassed by the XPL-200As for use in a home environment. The XPL-200A may be the perfect home audio reproduction system. Unlike professional monitors such as the JBL LSR6332 and M2, the XPL-200A approaches the level of detail required for professional mastering, but stops just short of the extreme levels needed in the studio. The LSR6332 and M2 systems are too revealing of the recording, and allow the listener to hear every studio error. They take the enjoyment out of listening to many older recordings. Whereas the XPL-200A, by stopping just short of this level of detail, makes listening to many older recordings more pleasant than on any other loudspeaker system we’ve ever experienced. The XPL-200A, along with its matched DX-1 crossover is by any measure a world class loudspeaker system, even by 2016 standards. The only improvement we could imagine would be to replace the 2214H-1 12″ bass transducer with the 14″ LE14H-1, but that would make the XPL-200A into the almost mythical XPL-250A.